It is that time of year when you might be starting to think about where to take the family in 2018. We can highly recommend Ecuador and the Galapagos Islands. Perfect for family holidays Ecuador is a relatively compact country with numerous highlights. It is easy to get to and quick to travel around as all cities are connected by fast modern roads, and internal fights are short and reasonably priced. It is a pretty safe country to travel in, the food is good and there is lots to do for everyone. Like all the Andean countries it is very child friendly. Restaurants and cafes cater for families. When I took my four year old to Ecuador he particularly loved the ice-cream, play parks and swimming pools. Now he is an active ten year old he loves the wildlife and any adventure activities like rafting and biking. Thankfully Ecuador offers a wide range of options so we are never short of things to do. There are fabulous hot springs, novel train journeys, lake hikes, volcanoes to climb and all levels of horse riding, mountain biking, tubing, zip lining and river rafting. Should I take my kids to The Galapagos Islands? Without a doubt the Galapagos are a fabulous place to take kids of all ages. Land based tours cater for younger children as you have a lot of flexibiity about how to use your time. Older kids might prefer a cruise. Whether cruising or land based we recommend 6 to 8 days. On cruises you tend to sail between islands overnight and have several landings and snorkel sessions each day. Land based tours can be tailored to suit your family. We can include one, two or three islands to use as a base and add in as many day tours, snorkels, walks or other activities as you would like to fit in. Galapagos activities which kids love include, snorkelling with sea lions and sharks, kayaking, assembling whale bones on the beach, watching land iguanas spit salt, crawling into empty giant tortoise shells, playing with local kids, biking on cycle paths, volleyball on the beach and surf lessons. Read more about taking kids to Galapagos on our blogs. Particularly Galapagos cruise with children. What can we do with kids on mainland Ecuador ? Here are some of our top suggestions for great activities to do with the family before or after your Galapagos trip, or as a stand alone Ecuador holiday. 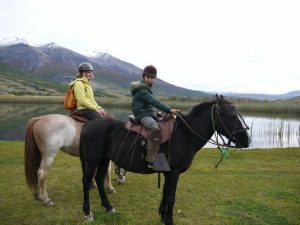 Stay at a highland hacienda like Zuleta or Hacienda Porvenir in Cotopaxi national park for a few days of horse riding, stunning mountain walks, and loads of space for running around. Other haciendas offer the chance to join in with milking, cook or make cheese, and hang out with the local kids. All the haciendas offer horse riding and tend to have gentle horses suitable for all abilities. Visit an animal rescue centre in Ecuador (Amazoonico) and see conservation work, learn about the dangers of animal trafficking, and you’ll see plenty of animals. Go whale watching on the coast, from Pto Lopez, where you can see artisan fishermen bring in the catch each day. Even in Quito there is plenty on offer for active families. The Botanical Gardens in Quito have trails to follow through different ecosystems of Ecuador – paramo, cloud forest, subtropical forest, arid regions. There are also several hot houses with rainforest, carnivorous plants, orchids. Nearby is the Vivarium which is small but worth a visit to see amphibians and reptiles. The cable car in Quito, known locally as the teleferico, is fun for kids. Take a picnic and plenty of warm clothes and you can hike up the mountain from the top – or take a pony ride. A café provides warming hot chocolate. At the base of the cable car there’s an amusement park kids might drag you into. In Quito there is an open topped jump on off bus which takes you around Quito’s main sites. There is also one in Cuenca which is great fun too. For wildlife and activities, you can’t go wrong in Mindo the cloud forest near to Quito. There are heaps of fun things for families – zip-lining, tubing or white-water rafting on the river, a butterfly house, chocolate workshop, bird watching and night walks looking for creepy crawlies. Another cloud forest lodge excellent for families is Maquipucuna. You can swim in the river and waterfalls, help in kitchen (making Quimbolitos, Bolones or homemade granola for breakfast the next day), and visit the local school for a game of football. Some of the Amazon lodges are particularly good with kids, offering private specialist guides. There is a good chance of spotting monkeys, river dolphins, giant otters and loads of birds, butterflies and frogs. For kids interested in music and crafts we recommend a visit to the family of Andean musicians in Peguche (near Otavalo). Here you see how instruments like pan pipes are made. Whole families will play for you and near-by you have back-strap weavers who demonstrate weaving techniques, use of plant dyes. Banos, in addition to the hot pools offers biking, fabulous walks and taking the “tarabitas” (cable cars) across the river, visiting the Swing at the End of the World (it’s not as scary as it looks!) and watching local people make the hand – pulled nougat on street corners. If you end up in Guayaquil it is worth a visit to the Parque histórico where there is an animal section, a historical homes section, and then you have the river front. Contact us to find out more about our suggestions for taking your family to Ecuador and Galapagos. Check our photos on our Active family Holidays in Ecuador and Galapagos facebook album.